i received this charge-sheet and summons a while back, it is just for one charge relating to how i ‘did post a document on a structure namely advertising board’ inside southern cross station on the 14th of february 2013.
all the other charges are being compiled into one big thing of charges that will all be dealt with at once, but for some reason this one charge was put through on its own by a separate informant (police person pressing the charge). i called up the informant for all the other charges and asked her what was up, she said as this charge has already been put through, the only way to get them all heard at once would be if she got all her charges ready for the same hearing date, but for some unimaginable reason she said she couldn’t do that, even though the court date was over 2 months away at the time. 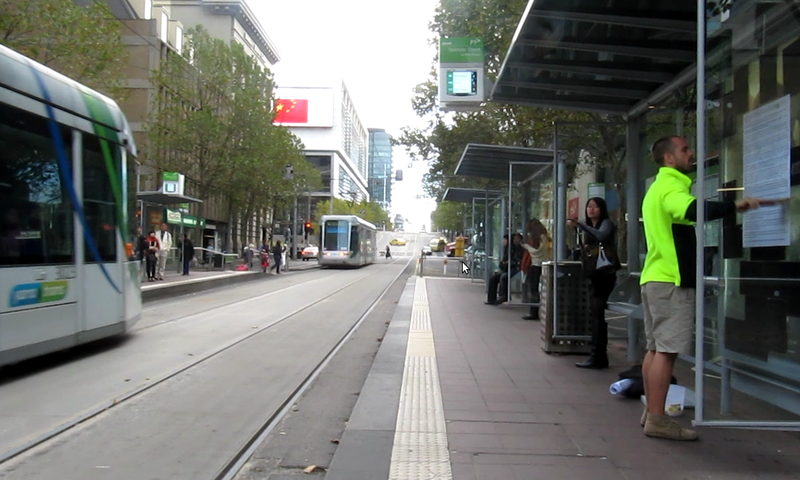 anyway, the date of the hearing is the 19th of june in the melbourne magistrates court – if for some reason anyone wants to come along, they are most welcome, although i can take no responsibility for the quality of time had, it is usually simultaneously intensely boring and intensely depressing. in other developments, i made a new poster. this time i made it all one sheet to keep it simple (a police person once expressed confusion as to where to start reading when i had a number of posters). i made it in dot point form to make it slightly more palatable to the reluctant reader, but i was unable/unwilling to simplify it that much. 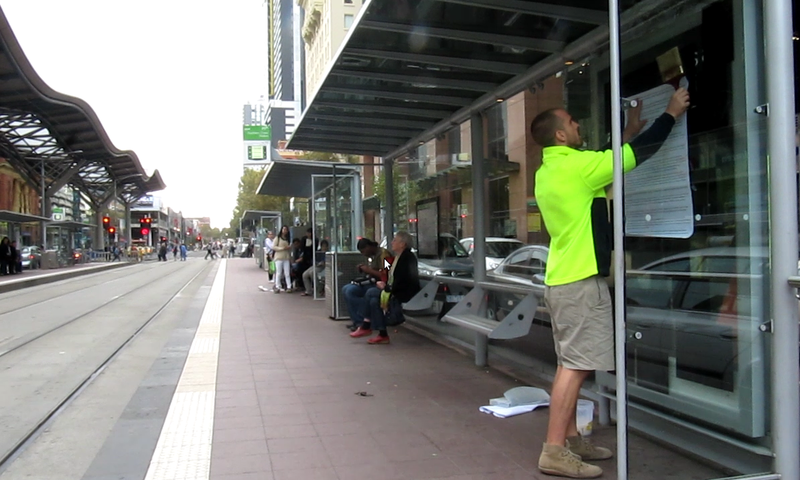 here is a couple of action shots of me sticking up this new poster, on spencer street and collins street (close to/out the front of southern cross station) on the 4th of may. i covered over 10 panels at quite a casual pace, using up all of the paste i had, but no police showed up. i decided to just walk away instead of standing around waiting to have what would most probably be an unpleasant interaction with police (if anyone had even called them). i would say the ad company or whoever would report it to the police eventually anyway, and as i put this website address on the bottom, they could have no doubt as to who was responsible.